Christmas may have passed six weeks ago, but that isn’t the case for one neighborhood in northern San Diego. Ellingham Drive in the Rancho Penasquitos suburb is known as Christmas Card Lane during the holidays. Everyone on this street puts up festive light displays and decorations. They usually take them down after Christmas is over but this time around, everyone in the neighborhood has kept their decor up well into the New Year for the sake of a neighbor who had missed his favorite holiday. 24-year-old Ryan Caine was rushed to the hospital on December 12, 2018, for what they thought was the flu. It turned out to be much worse: pneumonia. Ryan’s pneumonia swiftly turned septic, causing him to go into cardiac arrest more than once. The doctors put Ryan into a drug-induced coma that lasted more than six weeks. Like their neighbors, the Caine family home was decked out for Christmas but parents Russ and Janet Caine spent the holiday season at their son’s bedside in the hospital. At one point, Ryan was put on life support as his chances of survival were slim. “We said, ‘No, Christmas can happen anytime, and it is waiting for you at home,” Janet told NBC 7 San Diego. Indeed, it was. On February 6, Ryan was discharged from the hospital. He returned home to a surprise welcome by his neighbors, who sang “We Wish You a Merry Christmas” on their still-festive street. 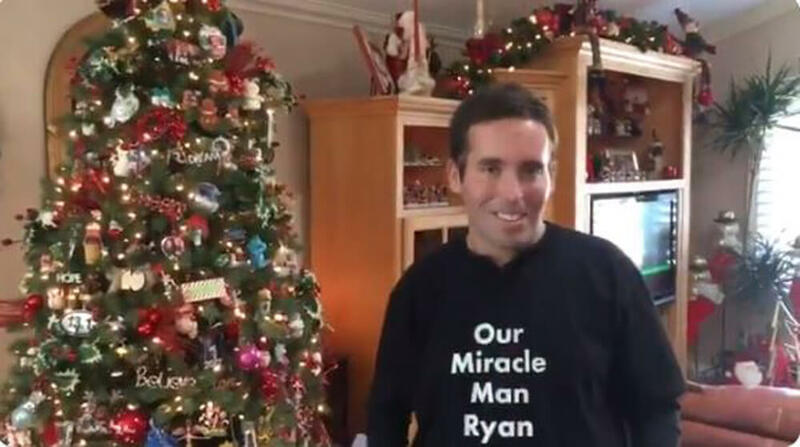 Ryan entered his home to see a Christmas tree with wrapped presents underneath it.